Along with our Holiday Specials, we are running a promotion for Klein tools and gear. 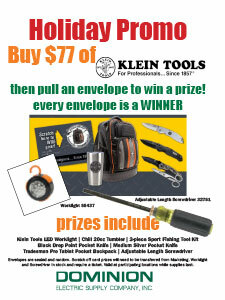 Buy $77 of Klein Tools and then pull an envelope to win a prize! Every envelope is a WINNER. Envelopes are sealed and random. Valid at participating locations while supplies last. Stop by and Good luck! Pick up our Holiday Specials flyer HERE. Free hat with purchase of anything on the flyer!